Equine Spa Therapy: Verifying Healing using Ultrasonic Scans. In the early spring of 2003, Harry, a thoroughbred racehorse, sustained a severe superficial digital flexor tendon injury due to a fall in a race. He was subsequently rescued from the slaughterhouse and found his way to the Raleagh Equine Rescue Centre where he was given box rest for five weeks prior to being brought to the Centre of Equine Therapy in Dromore, Co. Down on the 10th April. His rehabilitation was filmed by BBC Bristol and was broadcast nationwide in July 2003. 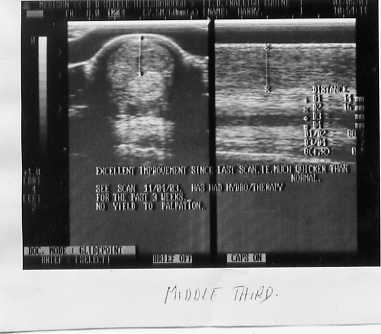 The first scan, shown on the left below, with longitudinal and cross sectional views, was taken on 11th April 2003 prior to commencement of Equine Spa Hydrotherapy treatment. Despite 5 weeks of box rest the tendon is still showing over 90% damaged tissue i.e. virtually anechoic. In the opinion of Bruce Steele, a specialist Equine Vet with over 20 years experience, it would take at least 2 months to show a relatively minor improvement. After 2 weeks Equine Spa therapy the swelling and heat was considerably reduced so a second scan was booked. The scan on the right was taken on 1st May 2003 following 20 days of treatment and was filmed again by the BBC. 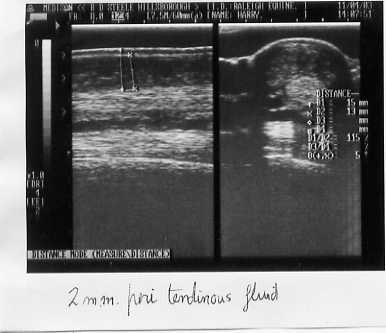 The right hand scan shows that the peri-tendinous fluid has dissipated and the tendon is showing good parallel alignment of healthy tissue i.e. much whiter in appearance. Also, on palpation there is no longer any pain. In Mr Steele's expert opinion this level of recovery was very much faster than normal. Equine Spa treatment was continued for a further 2 weeks during which period Harry was gently exercised in hand and 1 week later he was being ridden and he quickly found a home as a general purpose riding horse with a 12 year old girl. A much better outcome than the original prognosis. 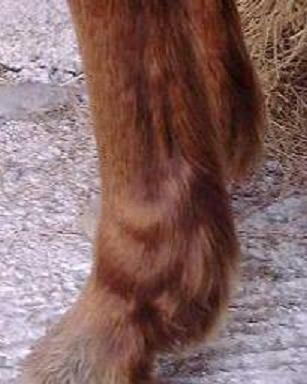 Below is the expanded longitudinal view of the same foreleg. The two "x's" show the superficial digital flexor (SDF) or tendon which is just below the skin. The SDF is black in colour showing over 90% tendon damage. The following picture shows the same leg after just 20 days of hydrotherapy treatment. I was very pleased to find your article on Harry the racehorse on the internet. I was especially pleased to find he had been rescued from a slaughter house. I was so pleased as I own Harry. His name is now Spike and he has recovered completely. He has been doing everything from show-jumping to galloping along the beach! He is great company and he is really funny. When he wants food he throughs his buckets out of the stable and just generally is a bit of an eejit! I don't know what i would of done without him! 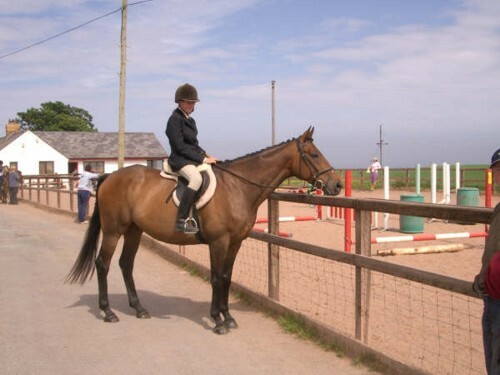 Here is a picture of him at a jumping league which he won although the jumps were not that height! This 16 year old polo pony, Poppy, had a number of long term problems in each leg. 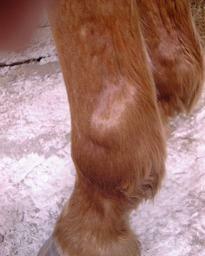 Before treatment, on the near fore you can see a distinctive wind gall and no distinctive tendon visible due to swelling of the leg. After 9 days treatment with the CET Equine Spa the wind gall is considerably reduced and the tendon is showing near normal definition. Wispa received a very nasty injury to her hind leg. The cannon bone, common extensor tendon and joint capsule of the hock were all exposed. She was put immediately into the spa. This cleaned out the wound, preventing infection, and prevented her leg from swelling up. The vet was then able to stitch the wound up to the hock. There was so little skin to pull together that it was felt unlikely that the stitches would hold. The hock itself could not be stitched and had to be left exposed. Wispa then received a daily spa treatment for the first two weeks in order to prevent swelling, bleeding and inflammation, maintain a clean wound, and also provide Wispa with pain relief. For the following two weeks, she then received a treatment every second or third day. This encouraged tissue healing, while at the same time reducing any inflammation, and keeping the wound clean and free from infection. Along with good bandaging between treatments, the spa has really accelerated the healing process and helped prevent complications such as infection, swelling, burst stitches, joint stiffness and wound contracture.